Drive into Granby east along Rt. 20 and you can't help but notice a couple of hand painted signs spiked onto two trees beside Salmon Brook (below). Their messages, "Cherish Granby--Resist Developmt." 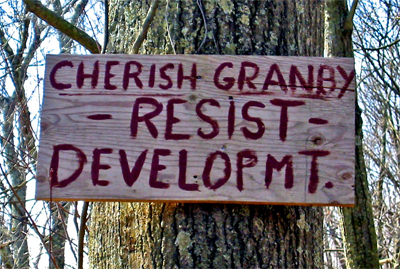 (sic) and "Celebrate Pristine Granby--Don't Develop" seem to sum up how many have come to feel over the past few years, not just here in this quiet old farm town northwest of Hartford, but around the state. Like many in Connecticut, Granby is a town where residents share a strong "spirit of place," one that has developed over the past two centuries, since colonial days. It isn't something that towns usually put into words or write into official documents, at least before people such as the residents of Granby saw it as essential in their effort to preserve what is special about their town well into the future. Views of Holcomb Farm and the West Branch of the Salmon Brook in Granby. Last year, the Granby Planning and Zoning Commission appointed a subcommittee to draft a new Plan of Conservation and Development for the town. (The state requires towns update plans every ten years.) The subcommittee reviewed Granby's 1993 plan, held public workshops and facilitated an agreement about things that made Granby special and reasons residents chose to live there. The result was a statement of the Town's Fundamental Values, a new 10 Year Vision for conservation, preservation and development, and recommendations for implementation. The view from atop the ridge west of Holcomb Farm looking southeast across Granby, toward the Barndoor Hills and the Metacomet Ridge. 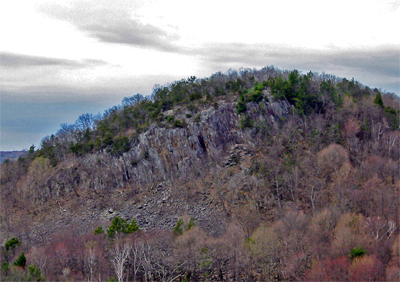 The hills and the ridge are the remains of lava flows in from The Age of Volcanism the Connecticut Valley some 200 million years ago, as described by geologist Greg McHone in his guidebook, Great Day Trips to Discover the Geology of Connecticut. The plan begins with a "Statement of Granby’s Fundamental Values" that is refreshingly easy to read and understand and highly evocative: "Agricultural: Our Town’s rural character has its roots in…the small farm...Viewing the livestock, smelling manure, experiencing the changing scenery of the fields…is a treasure that will be missed if it is allowed to disappear. Residents: The residents of Granby apply a broad definition to the term “neighbor.” They show concern and offer help to one another during times of sickness, grief, unemployment or other difficulty…Granby residents cherish the natural environment and are willing to work for its preservation. Wildlife: We look to the sky when we hear the chatter of the geese and we quickly spot the familiar V pattern of their flight. We stop and listen to the chant of the morning dove, the hoot of the owl and the melodies of the songbirds…We catch and release, turn rocks in search of salamanders and shriek at the sudden movement of a snake. We choose to make our home among the wildlife and we are the better for it." A view from one of Granby's Barndoor Hills (west) of the other (east). The hills are outcrops of once molten rock that intruded through sedimentary layers in the valley and have since exposed by the effects of erosion. "That the Town’s quality of life has remained high." Wild Red Columbine (Rock Bells) found growing among the basalt talus of the Barndoor Hills in Granby. 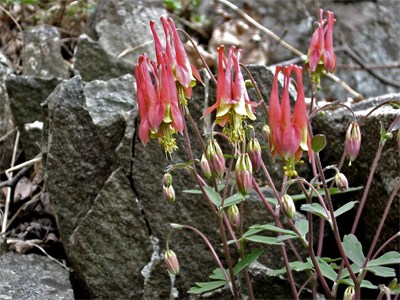 A member of the Buttercup family, the Ranunculaceae, with the scientific name of Aquilegia canadensis, Red Columbine is a favorite of hummingbirds. The values and vision statements were used to guide the subcommittee in drafting the plan's goals and recommendations in specific areas including population and demographics, environment, housing, budgeting, taxation & grand list growth, transportation, commercial and industrial development and Granby center. In the area of environment, for example, the plan sets goals consistent with conserving residents "spirit of place:"
Preserve and maintain natural, cultural and historic resources. Protect, preserve, promote, and create wildlife habitat and corridors. Allow reasonable extraction of sand, gravel and other earth resources. The plan is notable for many reasons, an important one being that its development fostered a productive dialogue among residents and was able to gain consensus about attributes of the town that Granby residents sought to conserve and protect, and how they wanted to manage growth, development and commercial areas. Another is that the plan recognizes the value of open space for residents' use, recreational use, and its value to maintain biodiversity and natural resources. 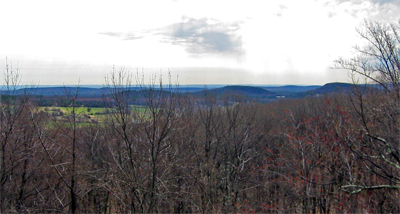 Just as the town seeks to preserve its wonderful ridgetop views it seeks to enhance habitat connectivity and wildlife "corridors" that are becoming increasing vital. Finally, by first setting the vision, planners established a reference point for developing the specifics of the plan and for evaluating all future proposals for conservation and development. Its easy for anyone to read the plan and decide how a proposal fits with the communities fundamental values or conflicts with the long term plan. It's an approach any town can integrate into its planning. Look into the last time your town updated its conservation and development plan and what you and your neighbors have done to describe your community's fundamental values. Even if your town has recently completed a plan, you don't have to wait ten years to provide your municipal government with your input. Towns can revise their plans any time they wish. If your town hasn't stated its values as part of a long term vision, you can get started right away. Thanks for the nice comments on Granby's Plan of Conservation and Development. The Town recently completed a study of the Case Street Area, and is considering adopting this study as an amendment to the POCD. The Regional Planning Agency has review the matter and recently wrote in support of the amendment, stating "We commend the Granby Planning and Zoning Commissionfor its thorough process - from the enactment of a subdivision motatorium on the study area, to the formation of a representative community committee and the formulation of specific recommendations, following an in-depth study. The resulting Plan amendment supports regional open space and conservation goals.